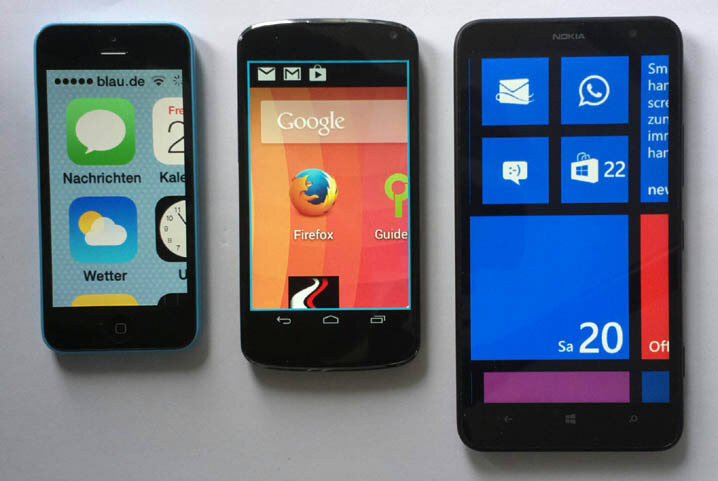 iOS, Android und Windows Phone - all three mobile operating systems support zoom magnification but in each of them it is implemented in different ways. We have checked out their usability. Once zoom magnification has been activated in the OS settings, it can be triggered by a tapping gesture. With zoom turned on, the zoom factor can then be changed and panning across the screen (moving the magnified section) is possible. The gestures differ according to the respective operating system (see below). In sum, iOS offers the neatest implementation of zoom magnification. The gesture for zooming (double-tap with three fingers) is specific enough not to be confused with other gestural input. With Android (triple-tap with one finger) as well as Windows Phone (double-tap with two fingers) it occasionally happens that instead of zooming in, elements under the finger tips are accidentally activated. (+) Maximmum zoom factor: 5x, continuously adjustable, blurry edges. (+) Move between screens / states: When launching apps, the focus is set to a spot at the centre-top of apps. No meaningful focus movement to logically next elements within processes. Remarks: The use of the virtual keyboard with strong magnifcation is a bit buggy (occasionally there is a slow auto-scroll across the keyboard). When changing OS settings: Label and controls are far removed from each other with strong zoom, however, the horizontal lines make the association easier than on Windows Phone. (0) Activating the zoom: Triple-tap with one finger (unless the gesture is well executed, this can lead to the accidental activation of elements). There is an additional function, triple-tap-and-hold: a circular magnification pops up that only persists as long as the finger touches the screen. The magnified area follows the finger. (0) Move between screens / states: When starting apps or triggering other states within apps, the view returns to the unmagnified state. Drawback: Repeated activation of zoom by triple-tapping is necessary. Advantage: A better overview (when usable), direct tapping on the desired area can be quicker than panning. (++) Maximmum zoom factor: 8x, continuously adjustable, blurry edges. (-) Move between screens / states: Zoom factor remains, but selected section on new screen is often not helpful / often just blank - no easy orientation for panning. No meaningful focus movement to logically next elements within processes.